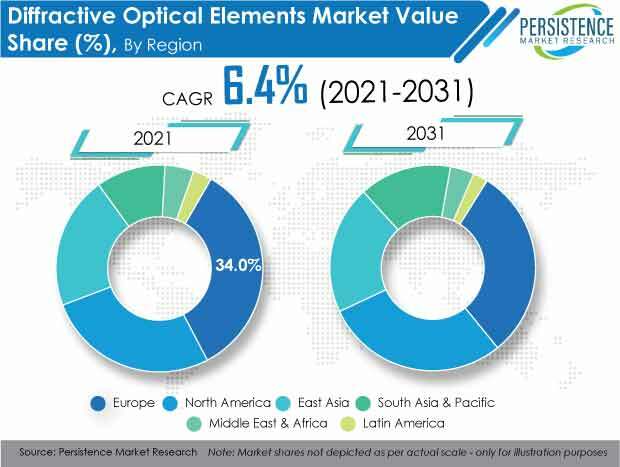 Persistence Market Research (PMR) offers an 8-year forecast for the diffractive optical elements market between 2018 and 2026. In terms of value, the diffractive optical elements market is expected to register a single-digit CAGR during the forecast period. This study demonstrates the global diffractive optical elements market dynamics and trends across seven regions: North America, Latin America, Europe, China, Japan, SEA & others of APAC, and MEA, which influence the current nature and the future status of the diffractive optical elements market over the forecast period. This diffractive optical elements research report provides a detailed analysis of the diffractive optical elements market and offers insights on the various factors driving the popularity of diffractive optical elements. The report includes an extensive analysis of the key industry drivers, challenges, market trends and market structure. The diffractive optical elements market study provides a comprehensive assessment of stakeholder strategies and imperatives for succeeding in the diffractive optical elements business. In addition, the diffractive optical elements report segregates the market based on type, application, industry, and different regions globally. The diffractive optical elements market is expected to witness significant value growth during the forecast period owing to an increase in the spending of various countries around the world on research & development as well as growth in the number of research activities. The diffractive optical elements report starts with an overview of the diffractive optical elements market in terms of value. In addition, this section includes an analysis of the key trends, drivers, and challenges from the supply, demand, and economy side, which are influencing the diffractive optical elements market. The diffractive optical elements market is classified on the basis of type, application, industry, and region. By type, the diffractive optical elements market is segmented into beam splitter, beam shaper, and diffractive homogenizer. Based on application, the diffractive optical elements market is sub-segmented into laser material processing, biomedical devices, LIDAR, lithography & holographic lighting, optical sensor, communication, and others. A detailed analysis has been provided for every segment in terms of market size analysis for the diffractive optical elements market across different regions. This section provides a detailed analysis covering the key trends. The next section contains a detailed analysis of the diffractive optical elements market across various countries in the region. It provides the outlook for the diffractive optical elements market for 2018–2026, and sets the forecast within the context of the diffractive optical elements market. This study discusses the key trends within countries contributing to growth of the diffractive optical elements market, as well as analyses the degrees at which the drivers are influencing the diffractive optical elements market in each region. The key regions and countries assessed in this report include North America (U.S. & Canada), Latin America (Brazil, Mexico & the rest of Latin America), Europe (Germany, U.K., Spain, France, Italy, Russia, & the rest of Europe), Japan, China, SEA and other of APAC (India, Malaysia, Indonesia, Philippines, Thailand, Oceania, & the rest of SEA & APEJ), and MEA (GCC Countries, Northern Africa, South Africa, Turkey, & the rest of MEA). This report evaluates the present scenario and the growth prospects of the diffractive optical elements market across various regions globally for the period 2018 –2026. We have considered 2017 as the base year, and provided data for the remaining 12 months. To offer an accurate forecast, we have started by sizing the current market, which forms the basis of how the diffractive optical elements market will grow in the future. Given the characteristics of the market, we have triangulated the outcome of different types of analysis based on the technology trends. As previously highlighted, the global diffractive optical elements market is split into a number of segments. All segments in terms of type, application, industry, and different regions are analyzed in terms of basis points to understand the relative contributions of individual segments to the growth of the diffractive optical elements market. This detailed information is important for the identification of various key trends in the global diffractive optical elements market. In addition, another key feature of this report is the analysis of all the key segments in terms of absolute dollar opportunity. This is traditionally overlooked while forecasting the market. However, absolute dollar opportunity is critical in assessing the level of opportunity that a provider can look to achieve, as well as to identify the potential resources from a sales and delivery perspective in the global diffractive optical elements market. In the final section of the report, we have included a competitive landscape to provide clients a dashboard view based on the categories of providers in the value chain, their presence in the diffractive optical elements market, and key differentiators. This section is primarily designed to provide clients an objective and detailed comparative assessment of the key providers specific to a market segment in the diffractive optical elements supply chain and the potential players for the same. Report audiences can gain segment-specific vendor insights to identify and evaluate the key competitors based on an in-depth assessment of their capabilities and success in the marketplace. Some of the key competitors covered in the diffractive optical elements market report are Broadcom Inc., Jenoptik AG, SÜSS MicroTec SE, HOLO/OR LTD., LightTrans GmbH, Sintec Optronics Pte Ltd., HOLOEYE Photonics AG, Laser Optical Engineering Ltd, Laserglow Technologies, and SILIOS Technologies. Diffractive Optical Elements (DOEs) have multilevel microreliefs (binary optics) or continuous microreliefs, with features ranging from submicron 10-millimeter dimensions and relief amplitudes of a few microns. These elements are mostly used in the micro-optic business in the recent times. In this report, PMR has segmented the global diffractive optical elements market on the basis of type, industry, application and region. By type, the diffractive optical elements market is segmented into diffractive homogenizer, which is also known as beam diffuser in the market, beam splitter, and beam shaper. The beam splitter sub-segment, followed by the beam shaper sub-segment, is expected to grow at a relatively higher CAGR in the diffractive optical elements market due to the increasing usage of diffractive elements like these in critical application areas such as in biomedical devices. However, the beam splitters sub-segment is expected to capture the largest market share of the global diffractive optical elements market and is expected to create an incremental opportunity of US$ 207.1 Mn between 2018 and 2026. As the governments from many various regions are spending highly on healthcare sector, they want the best medical devices facilities out of the investment. This is creating growth opportunities in the diffractive optical elements market and have been among the factors that are driving the market. Moreover, high spending on the research & development sector is creating potential growth opportunities for the diffractive optical elements market. Based on industry, the diffractive optical elements market is sub-segmented into telecommunication, healthcare, electronics & semiconductor, energy, and others. High spending on the research & development of biomedical devices and continuous innovations in the diffractive optical elements market are some of the major factors promoting the growth of the healthcare industry sub-segment. However, the electronics and semiconductor sub-segment is also expected grow at a relatively higher CAGR during the forecast period in the global diffractive optical elements market. In terms of value, the healthcare sub-segment is expected to create an incremental opportunity of US$ 93.4 Mn during the forecast period in the diffractive optical elements market. On the basis of geography, the diffractive optical elements market is subsegmented into North America, Latin America, Europe, Japan, Asia Pacific Excluding Japan (APEJ), and Middle East & Africa. The diffractive optical elements market in Europe is expected to dominate the global diffractive optical elements market owing to the high spending on research & development by various countries in the region as well as the presence of major manufacturers of diffractive optical elements in the region. SEA & other APAC and North America are also expected to capture a substantial market share in the global diffractive optical elements market owing to major technological advancements in the semiconductor & electronics and the strong presence of Tier-1 manufacturers in the region. Moreover, the diffractive optical elements market in Latin America and Middle East & Africa is also expected to grow at a high CAGR owing to an increase in government spending as well as the number of research activities. According to PMR analysis, long-term contracts with business partners are likely to increase revenue and new innovation strategies, which is expected to enable the manufacturers of diffractive optical elements to reach new growth markets. Moreover, the acquisition of businesses, technologies, and products is also expected to help the manufacturers of diffractive optical elements accelerate revenue growth and create value for shareholders. Some of the market participants in the global diffractive optical elements market report include Broadcom Inc., Jenoptik AG, SÜSS MicroTec SE, HOLO/OR LTD., LightTrans GmbH, Sintec Optronics Pte Ltd., HOLOEYE Photonics AG, Laser Optical Engineering Ltd, Laserglow Technologies, and SILIOS Technologies.